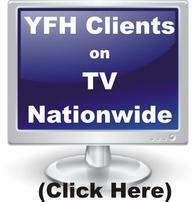 YFH Featured on the Nationwide Television Program, "The Incurables"
We have had several clients tell their stories about the health issues they faced on the syndicated TV series "The Incurables“. Learn how YFH helped them in solving their health problems. There is also the story of Judy Flickinger and how she conquered pancreatic cancer on YouTube. See how YFH was able to help her.